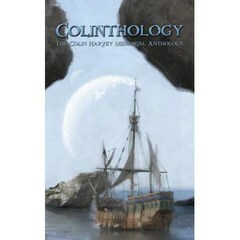 Colinthology is a collection of light-hearted, uplifting fantasy and SF short stories, put together in memory of Colin Harvey, who passed away suddenly in August 2011. All of the stories have been donated for free by friends of Colin, and all of the proceeds are being donated to Above & Beyond, the Bristol-based charity for which Colin volunteered in his spare time. I was proud to be asked to contribute to the Colinthology. For some reason I’ve never quite understood, people thought that Colin and I were brothers. It became a standing joke at conventions, with Colin getting his friends to come up to me and pretend they thought I was him. Obviously, we were both blessed at birth with outstanding good looks, prodigious talent and incredible modesty, but Colin had something else that set him apart from me and most other writers. Colin genuinely enjoyed every aspect of the writer’s life. Everyone likes to talk about their own work, even if they pretend not to, but I’ve never known anyone with as much enthusiasm as Colin for other people’s work, other people’s workshops and other people’s talks. Conventions will seem a little less inviting now that my brother will not be there waiting for me. This entry was posted on Sunday, October 21st, 2012 at 3:26 pm and is filed under Uncategorized. You can follow any responses to this entry through the RSS 2.0 feed. You can leave a response, or trackback from your own site.